Just in time for fall a new herd of Stablemates is galloping into Golden Oak Stables in exciting colors and breeds! These 3 inch tiny sculptures are packed with just as much detail as their larger counterparts and painted just as exquisitely! Breyer’s set of 8 new Stablemates will fill your stable with new horses on a tiny scale but with big personality. A dark bay Warmblood performing the Dressage move, the Extended Trot, begins the set. This stunning show horse is groomed with a braided mane and is ready for any level of Dressage. A dynamic and interesting sculpture, this little Warmblood makes big ways as he makes his way across the Dressage arena. A red roan Quarter Horse comes into the herd next with four socks and a docile and calm demeanor he’s the perfect every day horse for any horse lover. Flashy as can be and ready to light up the hunter circuit, a Chestnut Pinto Jumper rides into the arena. His flashy markings and striking color make him an easy standout in the ring. Full of fire and flash the blue roan Andalusian rears up in a striking position and his two front legs with white socks stand out on his blue roan coat. A calm and collected black leopard Appaloosa Sporthorse makes his way into the lineup with his calm gait and level head he’ll find his way as a favorite horse for young eventers everywhere. The spirit of the British comes in the form of a black pinto Gypsy Vanner. The Gypsy Vanner has become a favorite breed for horse lovers all over the world and this new herd from Breyer wouldn’t be complete without one. From the deserts of Arabia comes a stunning rose grey Arabian. A versatile breed, the Arabian can be found in any number of events and disciplines. Last but certainly not least is a sandy bay Cob. The Cob is a British breed that is beloved by many, its no wonder why when you see how simply beautiful they are! A wide variety of breeds lay within this new herd, all the colors of the rainbow as well as breeds from around the world! Celebrate the diverse equestrian world with this new herd of gorgeous horses! Galloping out of the hills of Scotland comes one of the largest and most recognizable horses in the world. The Clydesdale is a gentile giant that has found its way all over the world and has found its way into the hearts of many as a highly versatile and popular breed. The first Clydesdales can be dated to the early 1800’s in Scotland and while they once began as a small draft breed they have evolved into a large and beautiful breed of draft horse. Standing between 16 and 18 hands which is up to six foot tall at the shoulder, the Clydesdale weighs in at right about a ton, 2000 lbs! Clydesdales are often used for agricultural work and has found their way into the pleasure harness as well. Now the Clydesdale can even be found working under the saddle. Clydesdales are most often found in bay with white markings but other colors such as black and chestnut also can occur. Another common characteristic to the Clydesdale is the presence of roaning, which is white hairs mixed in with the base coat color. Often this can produce a striking appearance and accelerates with age. Breyer brings a new mare and foal set to collectors this fall with two sabino Clydesdales! The Clydesdale mare and foal set bring a stately mare and her ever so stately foal to Golden Oak Stables. With high whites, wide blazes and a belly spot on the mare, these Clydesdales exhibit classical sabino markings. Their deep honey bay color shimmers in the pasture and their beautiful markings accent their color beautifully. 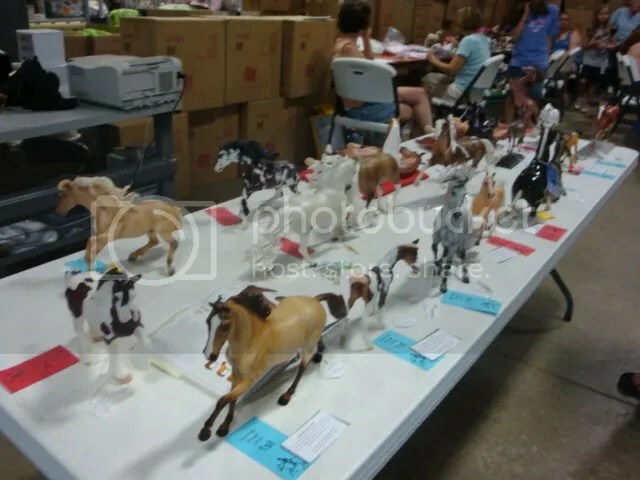 The Breyer Clydesdale mare and foal mold were released in the late 1960’s and has become a favorite for many. The Clydesdale mare and foal are some of the most favorite of Breyer sculptures and this pair will surely become a favorite! Standing large and in charge, the Breyer Clydesdale Mare and Foal set are an exciting new pair that have made their way into the Breyer line! Bringing a bit of British charm into the Breyer lineup of model horses, this mare and foal are sure to light up your collection and light up the show ring! About two years ago a mystery fell upon Breyer collectors. 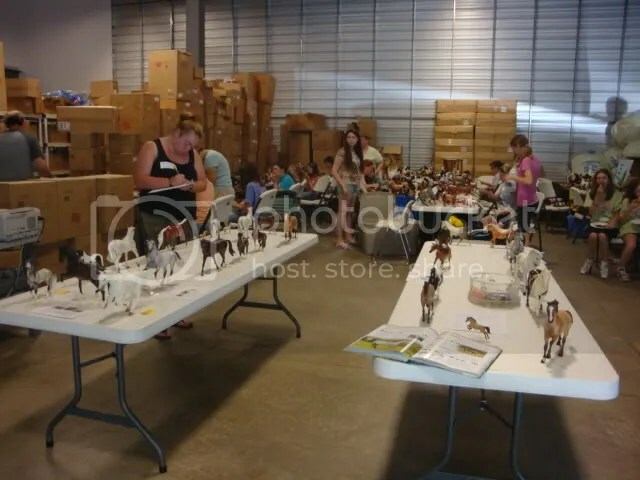 As they opened their new Breyer horses many noticed something a bit different. Upon close inspection the hoof of their new horse had a series of numbers and letters on it. Many questions have come up concerning these letters and numbers but now that the code has be deciphered it can be an important collecting tool to help collectors learn more about their horses. In spring of 2009 Breyer horses first began entering collectors hands with a few little black numbers and letters hiding under one hoof. There are two types of these combinations, one that begins with the letters VIN and one that begins with the letters A. Each of these combinations, while cryptic, can tell us a great deal of information. In 2008 the United States Government implemented the Consumer Product Safety Improvement Act in response to recalls stemming from imports. One of the stipulations in this new act was that all imports need to bear an identification number that can be traced to a factory in case of a recall. On traditional horses, this number can be found on one of the horse’s hooves. On the smaller scale models, this number has been found on the actual packaging of the model. The series of numbers and letters beginning with VIN or A then tell us which factory the models came from, but there’s another key piece of information that is very valuable for collectors. On horses marked with a VIN the three letters that follow will be the month the model is produced, example SEP or MAY. Two digits will then follow the month which will be the year the model was produced. on models marked with A four digit number will follow, example 0311, the first two numbers indicate the month the model was produced and the second two will indicate the year. This cryptic information can be especially helpful for collectors as variations happen with certain runs and horses are reintroduced all the time. Breyer has finally created an easy to follow system for collectors to date their models with and all with a few tiny numbers and letters! Have you gotten a new model from Golden Oak Stables recently? What do the numbers tell you? A fun line of horses that can span the ages of any horse lover, Pony Gals are full of fun with young in mind. This recent addition to the Breyer horse world is perfect or all ages but has the young and young at heart in mind. Pony Gals take a bit of fantasy and mix it with Breyer’s lifelike creations to give collectors a toy that steps it up to the next level with their realistic nature. Pony Gals come with accessories that encourage creative play letting your favorite horse lover or the horse lover in you play for hours and hours! Breyer’s Pony Gal Travel Barns sets are not only adorable but also easy to tote around and come with their own horse and accessories! Jasmine is a black Appaloosa and comes with accessories for her own Tack Shop Boutique in shades of purple. Dixie is a palomino beauty that comes with everything you could need to take care of a stable right along with her. Chloe is a bay pinto mare who’s ready to compete the day away with her horse show all packed up in her travel barn! Also in the Pony Gals line are three adorable purses with plush versions of the pony gals stars, Jasmine, Dixie and Chloe. Each bag features a purse and accessories that match the personality of their horse. Jasmine’s is purple as can be with a peppermint, her favorite. Dixie comes in a blue patterned purse that accents her palomino coat beautifully and her favorite treat is an apple! Chloe comes in a sporty pink bag and with a treat for her after a long show day, a carrot! There are many more fun toys and horses in the Pony Gals line from Golden Oak Stables! Each real life horse has their own personality and each of the three pony gals does too! One or all, there’s a perfect match for any horse lover! Many collectors have heard the term “Decorator”, but do you know what it means? Decorators have long been a part of Breyer’s history, even as far back to the earliest Breyers but the name came to popularity in the 1960’s when Breyer produced a series of blue and gold horses meant to be used ad home decoration. These colors, Wedgewood; a solid matte powder blue, Copenhagen; a glossy dappled blue, Gold Charm; a glossy solid gold and Florentine; a glossy dappled gold, would go on to become the most recognizable of all the decorators. The word decorator has gone on to mean any horse that is painted in an unrealistic pattern. The first real Decorators by that definition would be the Woodgrains which were produced from the 1950’s until the late 1960’s. Some other colors from that time period also include a glossy dappled black and a charcoal coloration. Both of these are often considered to be decorators but sometimes not. In recent years Breyer has brought back the love of decorators. In 1991 Breyer brought back the decorator with an Arabian painted in a bronze finish which was wildly popular with collectors. Since then Breyer has produced everything you can think of! Some of the more interesting ones are clear horses of all different colors, horses painted with logos, color changing paint, and more! They have brought back the decorator in a big way for collectors and they are popular as ever! The “original” four decorator colors even make an appearance from time to time and are always met with great popularity! This year Breyer has two decorators which not only are exciting collectors but also help in a big way! The Traditional and Stablemate Breast Cancer Awareness horses are both created out of clear plastic with a gorgeous pink tone. They each feature the iconic pink ribbon design in a whimsical and beautiful pattern. While they are beautiful as can be, the best part is that Breyer is donating a portion of the profits from each sale to the fight Breast Cancer! Decorators old and new are exciting and fun to collect, but with Golden Oak Stables you can collect a gorgeous decorator and help fight Breast Cancer too! Don’t miss out! August 27th 2011 novices from all over New England and beyond will come to Golden Oak Stables to finish out the novice show year! The final leg in the 2011 Golden Oak Stables Novice Series, Summer Break Live is your chance to get int the action in a fun, friendly and educational way! Linda Carrier, a long time model horse hobbyist is hosting and bringing her extensive knowledge to attendees. Golden Oak Stables novice shows are unlike any in the nation and some of the largest shows too. Classes and divisions that mimic an open show help novices get a “feel” for the open show scene and also improve their skills . Each and every division is a great way to learn not only more about your horses but also about real horses. Halter requires breed research to choose the right breed for your Breyer Horse as entrants are asked to name a breed for their horse. Some showers take extensive time to choose breeds for their models which can often pay off with blue ribbons. 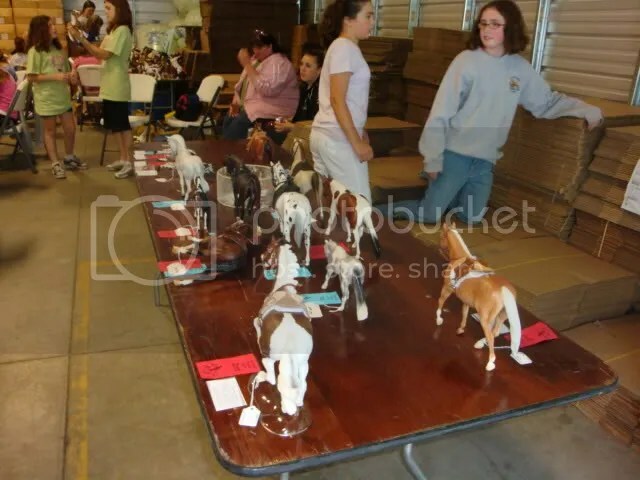 Collectibility is an original finish division that showcases rare and vintage models and showers are expected to research their model to tell a judge why its “Special”. There are hundreds of thousands of tid-bits in Breyer history over the past 60 plus years so a good collectiblity entry will explain everything a shower can find about the model. Custom classes are the classes for creativity to shine, especially in the Entrant Custom classes where only work by the owner may be shown. The art of customizing is a difficult one to master and it can take years to perfect but Golden Oak Stables provides a level playing field for customizers. Last but certainly not least is the Performance division which is in one phrase “Detail Driven”. Learning about the real sport which you are exhibiting is the most important thing in performance where entrants re-create simple to elaborate scenes depicting a real horse activity. It can range from a simple Western Pleasure class all the way up to an elaborate Scene Class! A fun and educational experience for all, Golden Oak Stables novice shows are the perfect way to begin or continue your time in the model horse world. Don’t fret more experienced showers, New England Fall Live is right around the corner to finish off the year with a bang! One of Breyer’s little mysteries, you may have Breyer’s “Scales” which are numbers that match up with each type of model. These numbers, 1:9, 1:12, 1:32 and 1:64 may not make much sense, but with a little simple math, you too can figure out this Breyer equation. Traditional horses correspond with the 1:9 number in Breyer’s equation. 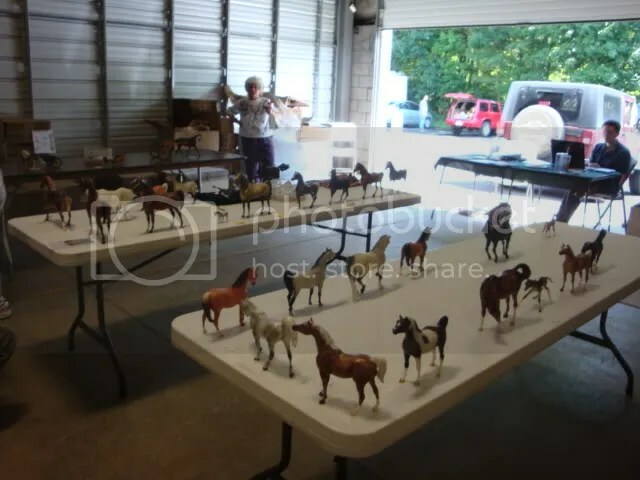 These ratios are a common way to refer to each “Scale” of Breyer horse. The one in the ratio stands for 1 inch and the second number, in this case 9, stands for the number of inches, in this case 9 that the inch represents. Traditional horses stand about 8 – 10 inches tall in many cases so by taking the 8 and multiplying it by 9 (Each inch counts for 9 inches) you can figure out that your Traditional scale horse stands about 72 inches or 6ft tall. Breyer’s Classic Scale often stand about 6 inches tall and are the second largest Breyer scale. Breyer figures these to be 1:12 scale, multiplying the numbers we once again get 72 inches or 6 foot tall at the tips of the ears putting the Classic Scale in perfect line with Traditionals. Stablemate horses are very popular due to their petite size. These little beauties stand about 2.25 inches tall in most cases and are packed with tons of details! Breyer brings these little guys in at 1:32 and our math once again puts them at 72 inches tall! 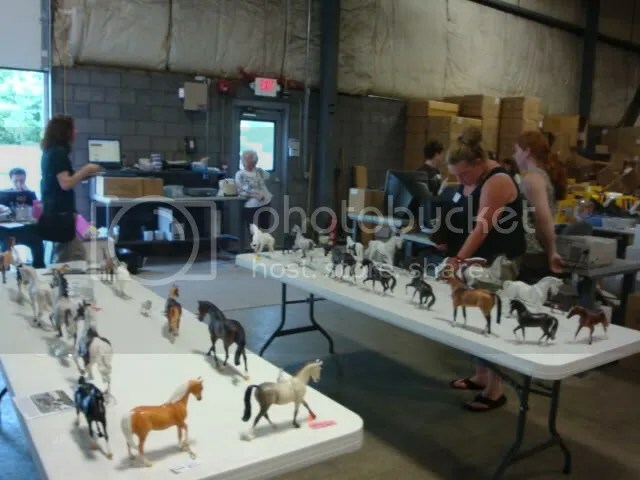 Mini Whinnies are Breyer’s smallest scale. Standing a bit over an inch tall, these little guys are so fun and so tiny! Full of details beyond belief they are the 1:64 scale models in Breyer’s lineup. They match up perfectly in Breyer’s scale calculation putting them just about 6 ft tall from hoof to eartip! No matter what the scale, each one is fun to collect and created with realistic artistry in mind. Breyer brings the realistic details we all desire right, from the large Traditionals to the tiny Mini Whinnies! What is your favorite scale? With this little mystery solved you can visit Golden Oak Stables and choose the scale and horse of your dreams! 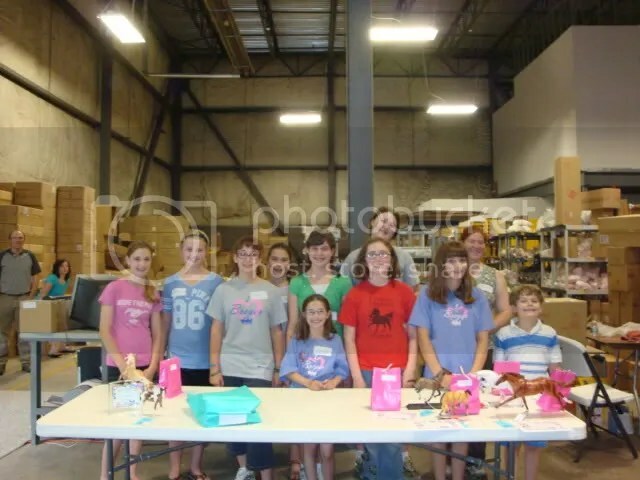 You are currently browsing the Stable News blog archives for August, 2011.